Upon a first visit to Lisbon – a city of castles, fado, and seaport vistas - you might be met by an unexpected surprise: The prevalence of graffiti. Rather than writing this off as an act of novice, we looked to embrace this art form and recognize its historic role as a political voice and its current impact for social inclusion. Our community partner, Yes You Can Spray, offers more insight on this important aspect that makes today’s Lisbon what it is. To start, give us a brief overview of the street art scene in Lisbon. What is the difference between “street art” and “graffiti” – or is there one? There are various ways to define graffiti and street art but roughly explained: Graffiti is a game of writing your name as many times as possible throughout the streets, in abandoned spaces and along train tracks. It is a visual language using colors and symbols to be recognized by other graffiti writers. Street art is a more illustrative representation with a story or message that is often political, philosophical, poetic or just a colorful interpretation of daily routines. Both graffiti and street art have a remarkable past in Portugal. When we look back to the 1970s, people used public spaces as a place to oppose the fascist government that ruled for 40 years. After the peaceful Carnation Revolution on the 25th of April 1974, the streets became an important place to promote the different political agendas. Brushes and buckets of paint became the prior tool of expression in the form of political murals. Why is street art such an important social voice, particularly in Portugal? Who benefits from both the creation and enjoyment of the art? Street art interventions offer perspective of the community the art is in. Street art festivals commonly pop up in neighborhoods that were once considered to be problematic concentrations of social issues related to criminality, drug abuse, prostitution, etc. – problems that were especially prevalent in the 1980s in Lisbon during the economic downturn. Artists from all over the world are invited to represent their murals in dialogue with the people that occupy those communities. It decreases vandalism while bringing more visitors and awareness to these once underappreciated neighborhoods. Small businesses can profit from the attraction of people from all over the world, politicians can gain extra votes due to their involvement in the realization of community projects, and artists can contribution to another open air street art gallery. Brazilian artist Marcio Bahia demonstrating incredible skill all done with spray paint that mirrors his works on canvas. Tell us about the artists. Who are they? How do they hone their crafts? Do they do this full time? Many of the artists have a background in the fine arts, design, or illustration. But also many of them learned the tricks of the trade in the streets. Some can even do this as a full-time job thanks to respect and appreciation that has grown over the years including the interest it triggers from city councils, photographers, local businesses, and art institutions. Artists we worked with through our collective include Utopia, Marcio Bahia, YouthOne, Jacqueline de Montaigne, CÄäT, Zarb. There are definitely other big names that participate with the city of Lisbon as well as travel around the world including Bordalo II, Andrea Tarli, Vhils, Obey, PichiAvo, Tamara Alves. All of them are marked in a very distinctive way based on the techniques and/or messages they used. Tell us about how Yes You Can Spray started. How do you engage within the art community in Lisbon? I was inspired by my research within the field of visual anthropology with which I tried to immerse people into my greatest passion: the exchange that takes place in the streets. The exchange between artists and people passing by. The exchange between what is written on the walls and the people surrounding. Getting to know the streets & art on a walking neighborhood visit. Yes You Can Spray started as a sequence of street art tours in Lisbon that engaged local artists and community participants to (legally) paint a wall and teach the tricks of the trade in interaction and experimentation with our audience. We also thought it would be interesting to connect international and local artists with one another and host a creative afternoon around a socio-cultural theme. We started with a celebration of International Women’s Day highlighting the subject with different female street artists in town. 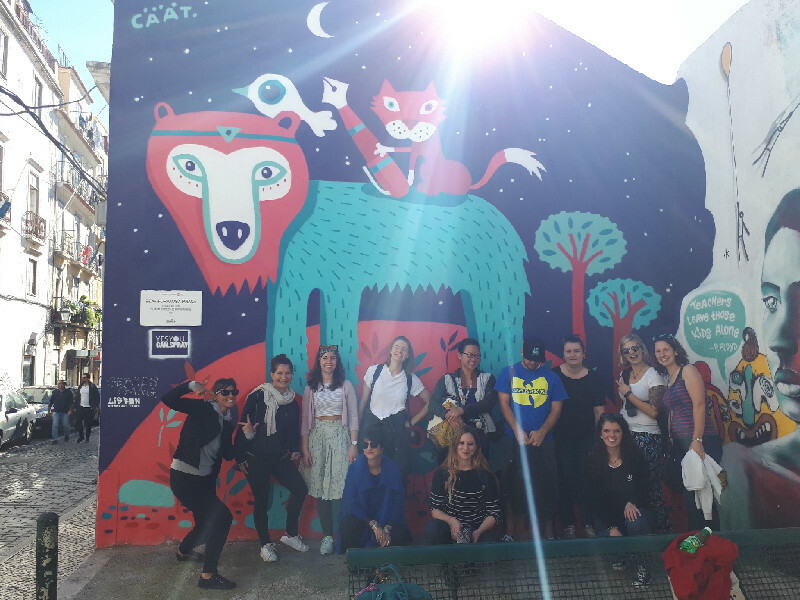 Lisbon Street Art Tours then became one of the offers of the collective to create a sustainable income through paint jams, street tours and a variety of activities for a wide audience. Our team is as dynamic as the street art field itself. Everyone involved, including myself, is doing the organizational and executive tasks on a voluntary basis. Events, social media, blogging, responding to artists in town, tourists passing through, new partnerships, fundraising, meetings, photography and video, building a street art cityguide, interviews...the list goes on. The connection and passion each feels for the field of street art, graffiti, artivism, and exchange brings us together to host a variety of artists within a variety of settings. An etching by the famous Portuguese artist Vhils, depicting a Brazilian human rights activist and councilwoman Marielle Franco who was killed. The unique style of Vhils can be seen throughout the city. If there’s one thing you’d like to world to know about social inclusion as it relates to art in Portugal, what would it be? Art can create and facilitate social change! Art brings people together. Art visualizes what words sometimes cannot express. I wish I could come up with less cliché sentences that would become viral in this world… but art is not just a rich & famous concept to be traded. It can be an interactive tool to engage people. And in the neighborhoods we work mainly as well as live as well as got involved into other projects, this is real. How do you feel that Traverse Journeys is aligned with your values? We believe and feel that Traverse Journeys, stimulating people, the planet as well as the purposes that guide us, represent a unique way of responsible travel with people you know or maybe never met before. This associates with what happens in public space: the exchange that takes place. The spontaneous encounters that engage us to stand still or walk by. And it is this cultural exchange we definitely see as a priority to enhance even more with local initiatives and artistic tools. This support towards makes the circle go round for Traverse Journeys. The attention to experiencing the other culture that seems so different but at the same time is also very similar. Want to experience Lisbon’s street art scene yourself? Check out our Taste of Portugal itinerary and follow Yes You Can Spray on Instagram!